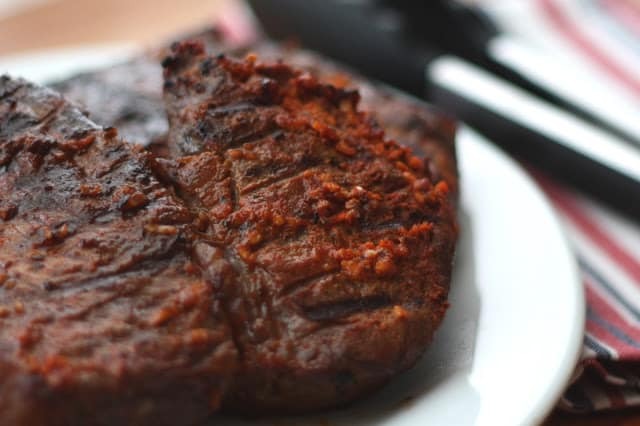 Steaks marinated in plenty of garlic, a squeeze of lemon, smoked paprika and marjoram were a great match for Garlic and Paprika Roasted Cauliflower and Roasted Red Potatoes. I am really liking the smoked paprika and garlic flavor combination and I’ve been playing with it a lot lately. meat very slowly at low temp first and then searing it at the end. We have reverse seared several steaks this past year and the only downside to the method is that it does take quite a while compared to the traditional quick sear on each side grilled steak. However, Reverse Searing is worth the extra effort every single time. I can not recommend this method highly enough. Any number of different rubs or marinades would have been great on these steaks. Even with nothing more than a bit of salt and pepper, reverse seared steaks are amazing every single time. Take the time one of these days and try it for yourself. You will have a hard time ever again just tossing a steak on the grill for a quick sear. 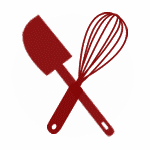 You can find the original Reverse Searing directions here. Preheat the oven to 250 degrees. Combine the garlic, oil, lemon and all the spices in a small dish. Rinse and pat dry the steaks and then rub them generously on all sides with the spice mixture. Place the coated steaks in a large ziploc or airtight container and let rest on the counter for 1 hour. Line a baking sheet with foil and place a wire rack above it. I have a cooling rack that fits into my baking sheets. Set the steaks on the rack and then place an internal thermometer in one of the steaks. thermometer, because these steaks are cooking by temperature, not time. 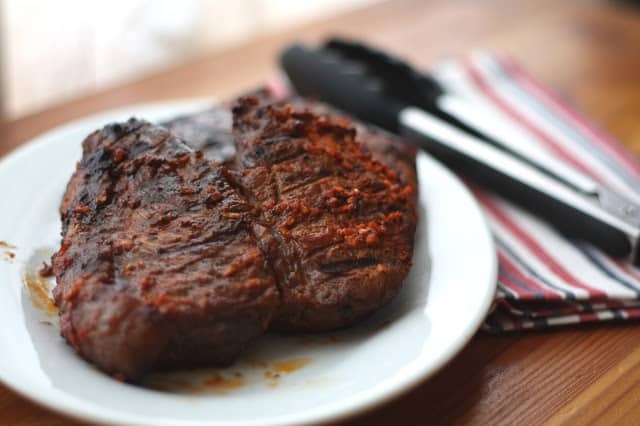 When the steaks reach about 115 degrees, preheat your grill to high heat. Once the steaks reach 130 degrees in the oven, transfer them to the grill for about 1 minute on each side. Remove from the grill and let them rest for 10 minutes prior to serving. I will have to try this method. We very often do the grill and then the oven to finish, but this kind of makes even more sense if you think about it. I also love this marinade. I bought smoked paprika thinking I would use it all of the time and I haven't used it yet for some reason. Jim wants steaks all of the time and I am kind of bored with them so this recipe/techniue would be a great change! P.s... glad it's warming up, but now that it's going to be 80 today, it's hard to believe it was in the low 20's just last week!! This sounds so interesting! I've never heard of this before. I really want a steak and miss them (and grilled chicken) so much during the winter. Not mocking - just saying - it is 13 degrees this morning. A bit chilly for outdoor grilling. Lovely hunk-o-meat! This sounds foolproof! I can't wait to try it! Any suggestions on specific cuts? What are your favorites? If I recall correctly, these steaks were a pretty thick cut top sirloin. Again, about half the price of the higher end cuts. I'm no expert at all though. I've been able to find favorite cuts by chatting with the butcher at our Farmer's Market whenever possible. There are often great cuts that are overlooked because the more popular names are so well-known. Good luck with it. I hope that helps. I've never heard of this---do you think it would work for chicken, too? And I love the color that the spices give the meat! I've never heard of this! I am so intrigued. 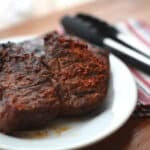 I sincerely agree with you on your assessment of the reverse sear for steaks, best steak technique ever! I don't use it every time because of time constraints but I use it as often as possible. I gotta try this! It's currently 6 degrees, but I'm going to try the second part in a screaming hot iron skillet. Just FYI...be sure your "cooling racks" don't have a coating on them. I tried to use mine in the oven and to say the meal was ruined is an understatement. We still have that horrible odor in the oven and the house!! I called manufacturer because I could find nothing that said it should not be used in the oven. The rule of thumb is if it is silver, you are okay. If it has a dark coating/apperance...forget about it. Great tip on the cooling racks, Tracee. Let me know how the steaks turn out on the skillet. Have a great weekend. Do you think this method would work with a grill pan, indoors? Thanks! I've never tried it myself, but it's worth a shot. Definitely get it as hot as possible, because you really want to sear them for the final step. Let me know how it turns out!